Yes, there is an age limit for whitewater rafting! 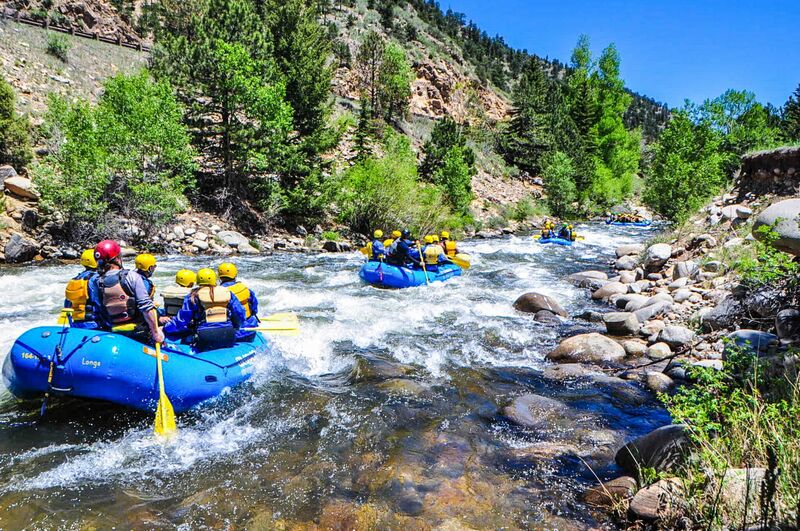 Recommended age limits on white water rafting trips in Colorado are dependent on the level of difficulty and the current water level. Safety and risk management is our number one priority at the Colorado Adventure Center. Recommended age limits are subject to change during high water conditions. Each of our whitewater rafting trips on Clear Creek has specific age limits and requirements. It is important to inform our reservation team of the ages of guests in your party and to complete the digital liability release form in advance. This way our reservation team can reach out to your party to reschedule or switch adventures if you have already booked your trip and high-water conditions prevent anyone in your party from participating. The age limit for the Clear Creek Beginner Whitewater Rafting trip is 5 years old. Please be aware that the age limit on this rafting trip can fluctuate depending on water levels. There is generally a period of a few weeks in June when the snowmelt runoff is peaking that our management team will recommend increasing the minimum age requirement. The age limit for the Clear Creek Intermediate whitewater rafting trip is 14 years old. The level of whitewater rapids jumps significantly for this trip. Guests must be able to cooperate with their river guide to navigate a series of Class II, Class III, and Class IV rapids. Be advised that age limits for the Clear Creek Intermediate trip can increase due to high water conditions. The age limit for the Clear Creek Advanced Whitewater Trip is 16 years old. Previous whitewater rafting experience, strong swimming abilities, and decent physical fitness are strongly recommended for this trip. This steep, fast-moving section of whitewater is famous for consecutive Class III, Class IV, and Class V rapids. All guests are required to sign a liability release form to participate in whitewater rafting. Minors must have a liability release form signed by a parent or guardian. Call 877-ZIP-RAFT today to speak with a knowledgeable member of our reservation team. Next PostNext Can I Go Rafting If I Can’t Swim?